Skid Loader, Skid Steer Loader, China Skid Steer Loader Manufacturer and Supplier. 1. Our skid steer loader have the solid overall structure: hydraulic oil tank, fuel tank, the sprocket gearbox and frame are together. Skid steer loaders the structure is more sturdy, the space is decorated reasonably compact, lifting arm with heavy burden-resistance is more reliable. 2. Safe and comfortable operating environment: ROPS and FOPS cabin. 3. Automatic parallel system: the bucket equipped with automatic leveling valve remains level during the lifting process. The international first-class brand of components: skid steer loader special hydraulic pump and motor are imported and original, bearings are international first-class brand, control triparte valves of high quality and hydraulic servo handle can ensure sensitivity and accuracy of operating. Our skid steer loader maintenance is easier: rear cover can completely open, cabin can make a large-angle tipping, which makes daily maintenance easier. Driving system with long service life and easy maintenance: Using high strength chain pre-tensioning to drive skid steer loaders, hydraulic motor drives through the both chains well designed to the wheels, making it easier to adjust and maintain, which can ensure the chain transmission efficiency and longer service life. 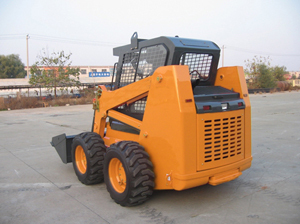 Unique structural features: small volume, light weight, small turning radius, multi-usage, which makes skid steer loader widely used in various situations. 1. Road civicism maintenance system: city road miller, cleaning, push to sweep the snow, smashing, etc. 2. Cleaning the scattered material, unstuffing and handling, etc of the ports. 3. Handling and cleaning the gushed arenaceous material of shipyard, cleaning the dropped slag of power plant and steel mill. 4. Loading and unloading, cleaning bulk material of different narrow space of mines, buildings, factories etc. World Equipment is a Chinese manufacturer and supplier of skid steer loader. Our products have already been exported to Europe, South America, Middle East, Southeast Asia and Africa. We have clients in Congo, Tanzania, Russia, Algeria, Philippines, Kazakhstan, Iran, Saudi Arabia, Nigeria, Indonesia, Malaysia, The United Arab Emirates, South Africa, Australia, and Sudan. We can always gain the trust of clients thanks to the products' high quality, the competitive price, profound industrial experience. If you need Skid Steer Loader, please contact us without hesitation. Meritor axle (specially used for motor graders). Hangzhou Advance gearbox (adopting German ZF technology).